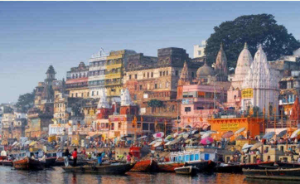 This is a great tour that packs adventure and culture along with the right ingredients of fun, excitement, relaxation and logical doses of knowledge too!! Get ready with your camera and binoculars make sure you also pack the passion of a naturalist and the patience of a nature lover which put together gives you the perfect attitude for the wildlife journey ahead. 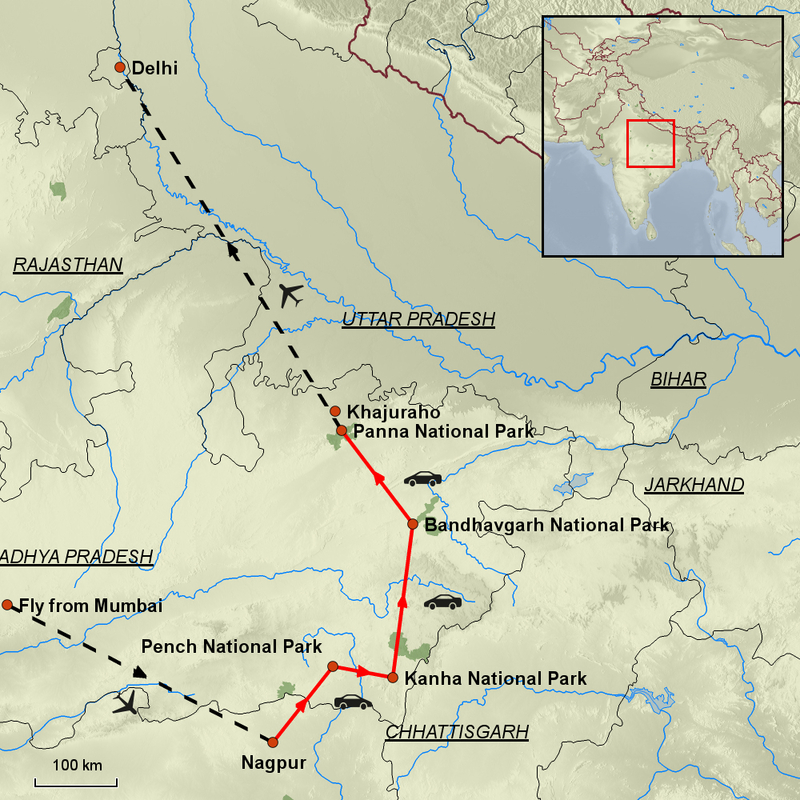 You begin tracing the tiger pug marks from Pench; a sprawling reserve surrounded by the Vindhyachal ranges. A self-sufficient system and dotted with 32 wooded hillocks and a variety of wild animals. 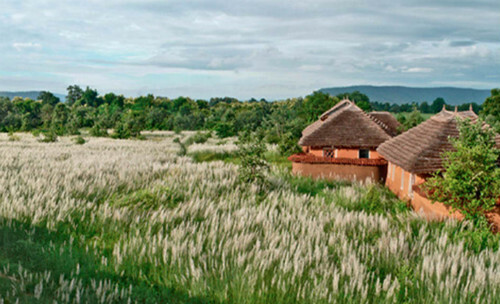 Your next destination Kanha is all the richer in a variety of deer’s nestled in the sal and bamboo thickets. The whole experience is very rich and remarkable especially the beautiful bird population in your next national park at Bandhavgarh. One gets to soak in the virgin beauty of crystal clear mornings and magical evenings in the folds of Mother Nature. Panna National Park, located on the river Ken is yet another tropical wildlife paradise. After such a happening journey centered around the jungles, your visit to Khajuraho brings you into a different world altogether. A World Heritage Site, Khajuraho has 22 exquisite specimens of ancient Indian architecture in the shikhara style temples. Each temple has a story to narrate! This tour offers a great blend; adventure and culture and of course the main attraction still stands out; spotting the magnificent and ever so elusive Tiger!! Yet another great tour arranged by Mystic India. Sharon we can tell you love India by the enthusiasm you have shown in all the tours you have arranged for us. Will speak to you next year, as we would now like to explore Sri Lanka. No doubt the most passionate travel company we have come across. Arrive Mumbai, VIP meet at aircraft door, assistant through immigration control, then meet & greet at departures door then transfer to your hotel. Rest of the day is at leisure to relax after your flight. 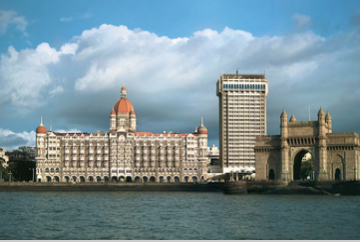 Transfer to Mumbai airport to board your flight for Nagpur. On arrival in Nagpur, you will be transferred to Pench NP (02 hrs). On arrival at leisure. This morning before breakfast you will proceed for a game drive in a shared jeep. Return to your hotel for breakfast, then at leisure until this afternoon proceed for a second game drive by shared jeep. You will drive to Bandhavgarh (4 hrs). This afternoon you are taken on your first game drive in the park by shared jeep. 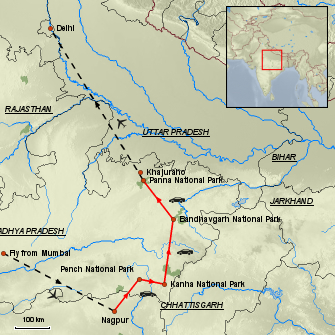 You will drive to Panna National Park (4 hrs). This afternoon proceed for your first game drive into the park by shared jeep. Drive to Khajuraho (1.5 Hrs). Enjoy a half day guided tour of Khajuraho. 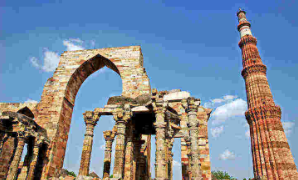 You will visit the famous Eastern & Western group of Temples. Later you will be transferred to Khajuraho airport to board your flight for Delhi. On arrival transfer to your hotel then at leisure. 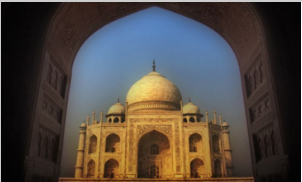 Today India bids you farewell with your transfer to the International airport. Situated in a gloriously remote and rural setting in the buffer zone with private access to its ‘own’ gate. Jamtara is a gem and provides a wonderful reason to travel to Pench, not only for the exceptional wildlife, but for the overall atmosphere and ambience of this special place. Sprawled across 110-acres of land is the Singinawa Jungle Lodge. Surrounded by trees, the only intruders here are the cheetals and the occasional wildlings. 12 cottages and 2 jungle bungalows, each tastefully designed. All of them have large bedrooms, private veranda, en-suite bathrooms with double vanities & rain showers, air conditioning & mini bar. 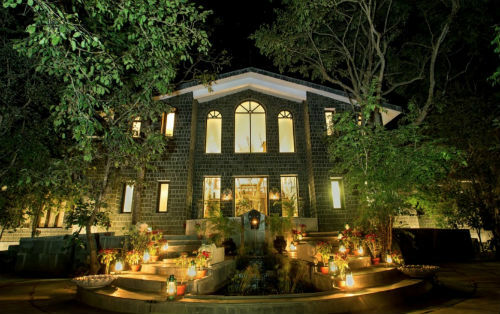 This is one of Mystic India’s favourite places to stay. 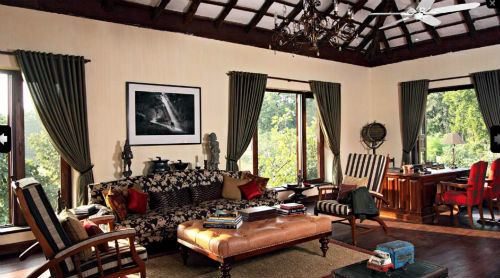 Samode Safari Lodge has taken Indian wildlife accommodation to an all new high. This exceptional lodge, with its wonderfully pretty and secluded location by the new, virtually unused entrance to the park, is the perfect base for Bandhavgarh. 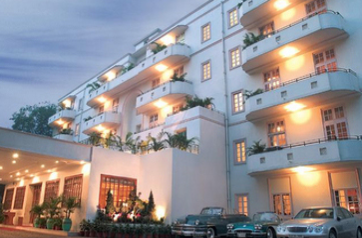 Located only half an hour’s drive from Khajuraho. It lies on the banks of the River Ken, less than 2 kilometres from the entrance to the Panna Tiger Reserve at Madla. 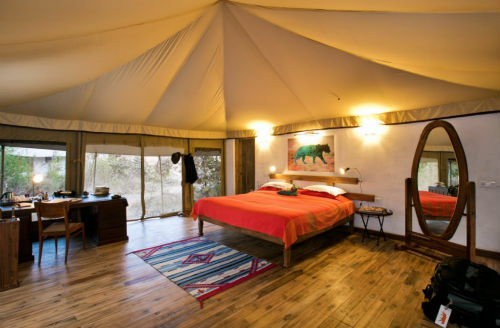 The Sarai at Toria is the vision of a husband and wife partnership with a passion for wildlife and conservation. 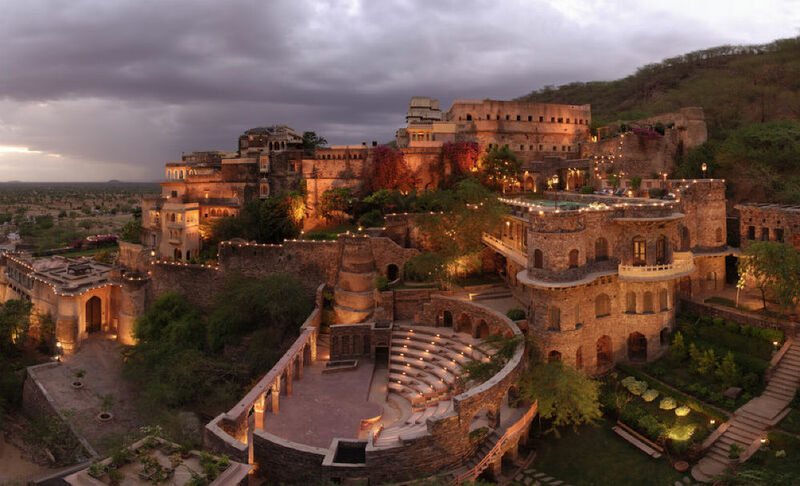 Neemrana is a wonderful heritage hotel, emerging out of the blue as a towering symbol of vitality in the heart of bareness. Located 2 hrs from Delhi.